The map below indicates the itinerary from the Highway. Click on the map to enlarge. 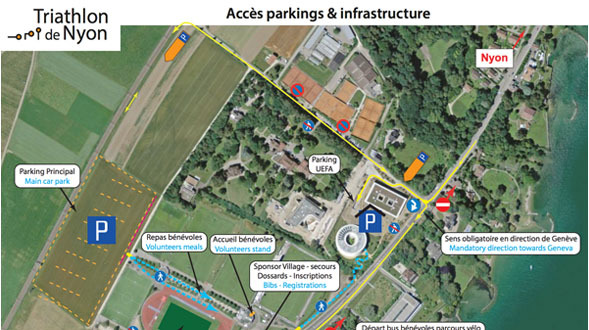 The Triathlon de Nyon is 5 minutes by car or 15 minutes walking distance from Nyon’s railway station. The area of the Triathlon is guarded by Securitas. Cycling : No water supply is available. Plan to bring your own water flask. Running : Water supplies are available about every 2 km. The first water supply is located 100 m after exiting the transition zone. Finish : Food and water are available at the finish area. With a goal to protect the environment, trash collection zones will be created in order to control pollution on both the bike and running courses. Any athlete who does not respect these zones risks to be sanctioned by the race referees. 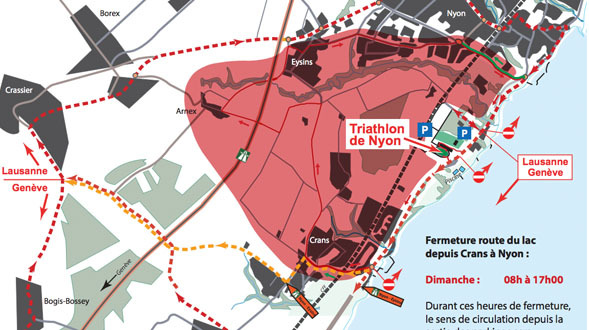 Our partner, Base Nyon allows you to benefit from preferential rates if you mention “Triathlon de Nyon” when booking. Other possibility : the Nyon Hostel for young people and families offers with its 27 rooms and 128 beds an ideal accommodation for triathletes, with kitchen at arrangement as well as garages for you bikes. A massage unit is at your disposal during the race. Weather at the beginning of August is variable. The weather can be very hot (30-35°C) as it can be less hot (20-25°C). The average temperature in Nyon at this period varies between 19°C and 25°C. The temperature of the lake varies between 18°C and 22°C.